Beautiful certificate from the Atlantic & Pacific Railroad Company printed in 1910. This historic document was printed by the American Bank Note Company of New York and has an ornate border around it with a vignette of Indians overlooking a valley and allegorical figures. This item has the signatures of the Company�s President, and Secretary, and is over 101 years old. There is a German Revenue stamp affixed to the face of the bond. 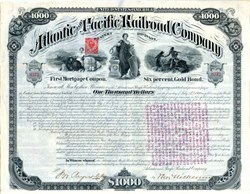 The Atlantic and Pacific Railroad was chartered by an Act of Congress in 1866. It was to run westward from Springfield, Missouri, through Indian Territory, thence to San Francisco along the 35th parallel. John C. Fremont headed the company, which was composed of investors from the eastern United States. The company also acquired the bankrupt South West Branch of the Pacific Railroad to ensure access into St. Louis. The South West Branch left the main line of the Pacific Railroad at Franklin (now Pacific), Mo., and had reached Rolla by 1860, but the Civil War bankrupted the road. The State of Missouri seized the line in 1865, re-named it the Southwest Pacific Railroad, and operated it until the sale to Fremont. The company was granted 12,000 acres of land per railroad mile. In 1889, the company was granted over 20,300,000 acres.